Media jackals predictably are braying that President Trump failed at the Hanoi summit. Nothing could be farther from the truth. President Trump wisely sent North Korea’s dictator, Kim Jong-un, back to Pyongyang from Hanoi, where he can tell the generals and security police commanders, on whose support he depends, that they are not going to get sanctions relief without giving up their nuclear arsenal. There is every sign that this outcome in Hanoi is a predictable stage in the process of obtaining consensus among the North Korean ruling class that they must give up on the strategy of confrontation and isolation, with their survival guaranteed solely by nukes, and instead open up to the outside world and the prosperity market economies can generate. But, of course, the Trump-hating media have leaped to the conclusion that the summit was a huge failure because President Trump sent Chairman Kim back home to Pyongyang with the message that ending the sanctions will require complete, verifiable denuclearization. President Trump abundantly signaled that he is not in a hurry for a deal — any deal — at the expense of getting a suboptimal result. 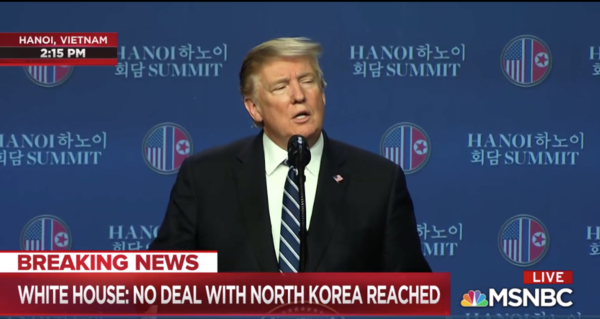 He set the expectation that, while optimistic about eventually getting to his goal of denuclearization, it might be a longer process than the short attention span media would prefer. Previous articleEffort to Abandon Electoral College Gains Steam. Here’s What It Would Ruin for America.